"Has it ever occurred to you," Alleyn said, "that the progress of a case is rather like a sort of thaw?" Roderick Alleyn comes of an excellent family. He was educated at Eton, then Balliol (one wonders if he ran into the young Lord Peter), and was expected to follow his elder brother into the Foreign Service; but, for reasons never articulated throughout the series (which is a credit to Marsh), he decided to throw over his potential FO career, and instead enrolled in the Police Department, where he neither requested nor received any preferential treatment, and began as an ordinary constable on patrol. Over time, his abilities moved him up, and when we first see him he is already a Detective Chief Inspector (as time passes, he rises in rank, but that's already a ways up--there's a fine chart of British police ranks in Dilys Winn's Murder Ink). His father is dead, but his mother--an intelligent and sweet woman, whom Alleyn is very fond of--is alive and well, and Alleyn not infrequently visits and confides in her. His elder brother, rarely actually seen, appears to be the classic detective-fiction elder brother, which is to say (in Monty Python terms), an Upper-Class Twit of the Year type (c.f. Mr. Campion and Peter Wimsey). Alleyn himself is rather too good to be true: tall, dark, and handsome (repeatedly described as looking like a cross between a monk and a grandee), highly intelligent, well-schooled, extremely well-mannered and courteous, brave, perceptive, sympathetic, and so on through the catalogue of virtues. But he is not a humorless Galahad: indeed, he has a nice if sometimes dry sense of humor, and a convivial outlook. He would seem to have private money, in that the manner in which he dresses and lives, while not ostentatious, seems rather more than his salary would likely manage. 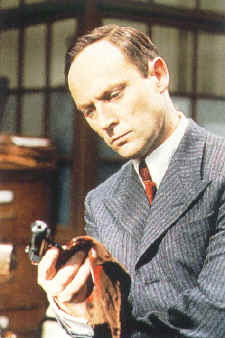 At the outset of the tales, Alleyn is stuck with a rather pathetically conventional Watson-type, a young journalist (always a handy occupation for a Watson-type) named Nigel Bathgate. The Alleyn tales from this era, fortunately a limited one, are quite conventional; they are mediocre Marsh, but even so give us a decent look at what will come to be her major strengths. This phase is rounded off by Alleyn's encounter with the nationally famous (perhaps world-famous) painter Agatha Troy, with whom he falls deeply in love; after a couple of books' worth, he marries her. (Some have seen Troy, as she is generally called, as a surrogate for Marsh herself, and there are certainly resemblances, though Marsh's painting never rose to the levels of success she attributes to Troy.) The romance element is, in my opinion, not well handled: indeed, it is rarely handled well in even the best detective fiction. But once Alleyn and Troy are settled down as husband and wife, things are better, which is fortunate, in that she (and later their children) figure in a striking percentage of the tales, a circumstance Marsh went out of her way to try to justify in each case (Troy is no meddler--indeed, both she and Alleyn, for somewhat different reasons, prefer that she be as isolated as possible from his work, but circumstances supervene with remarkable regularity). Alleyn is surrounded by a small cast of regulars, the most notable being his aide Sergeant Fox (affectionately nicknamed by Alleyn "Brer Fox"); Fox teeters between being a stereotype and a real character, seeming never, book after book, to ever progress in learning the French to which he is always studiously applying himself. Alleyn is, of course, as fluent in it as a native; fluency is to be expected in one being groomed for the Foreign Service, but his perfection is explained in one novel, in which we meet his old instructress, and quite a character she is, too. The Alleyn tales could easily have been a mediocre series of the standard pap of the era. What rescues them is, naturally, the author's abilities. Marsh does at least two things that raise the Alleyn saga above conventional mediocrity. First, in a great many of the tales (and almost always the best ones) we have what amounts to two stories: we begin with an Alleyn-less introductory, in which we meet and sample the lives of the persons who are later to be the victim (or victims) and the suspects, and which lead-in is often close to half the book; then comes the post-crime arrival of Alleyn and supporting cast, at which point the more usual police-procedural tale (somewhat idealized) ensues. The pre-crime story-within-a-story is usually quite good, and the personalities and conflicts plausibly developed; they make such interesting reading that we almost forget that they are only the prelude, not the opera (and at times the prelude has a definitely comic quality, which throws the subsequent killing into yet starker contrast). The second thing is simply Marsh's ability to produce, even within the conventional strictures of the detective story, sound prose, three-dimensional personalities (not all of them--there remain the usual stereotyped supernumeraries--but at least the chief ones), and engaging settings. In that connection--setting--it is noteworthy that though Marsh was a New Zealander, she anchored Alleyn solidly to the conventional (that word again) Scotland Yard background. But she was adroit enough to also engage him in a few cases actually set in New Zealand (the second World War and the need for skilled intelligence officers helped her there). Though she typically observed the classic sub-genre stricture of a limited circle of suspects in a more or less "hothouse" closed environment, she managed to vary the atmosphere sufficiently that we never feel we are seeing the same repertory cast merely tricked out in new costumes: each setting, each set of characters, seems unique and real. I like to offer readers modest samples of an author's style. These I select almost at random, flipping pages till I find what seems a reasonably compact yet self-contained and representative sample of the writer's prose. None of these tidbits are to be thought of any especial high point, but rather as a mere taste of the writer. Mr. Aubrey Mandrake was a poetic dramatist and his real name was Stanley Footling. He was in the habit of telling himself, for he was not without humor, that if it had been a little worse--if, for instance, it had been Albert Muggins--he would have clung to it, for there would have been a kind of distinction in such a name. Seeing it set out in the programme, under the title of his "Saxophone in Tarlatan", the public would have enclosed it in mental inverted commas. But they would not perform this delicate imaginary feat for a Stanley Footling. So he became Aubrey Mandrake, influenced in his choice by such names as Sebastian Melmoth, Aubrey Beardsley, and Peter Warlock. In changing his name he had given himself a curious psychological set-back, for in a short time he grew to identify himself so closely with his new name that the memory of the old one became intolerable, and the barest suspicion that some new acquaintance had discovered his origin threw him into a state of acute uneasiness, made still more unendurable by the circumstance of his despising himself bitterly for this weakness. At first his works had chimed with his name, for he wrote of Sin and the Occult, but, as his by no means inconsiderable talent developed, he found his subject in matters at once stranger and less colourful. He wrote, in lines of incalculable variety, of the passion of a pattern-cutter for a headless bust, of a saxophonist who could not perform to his full ability unless his instrument was decked out in tarlatan frills, of a lavatory attendant who became a gentleman of the bed-chamber (this piece was performed only by the smaller experimental theatre clubs) and of a chartered accountant who turned out to be a reincarnation of Thais. He was successful. The post-surrealists wrangled over him, the highest critics discovering in his verse a revitalizing influence on an effete language, and the Philistines were able to enjoy the fun. He was the possessor of a comfortable private income derived from his mother's boarding-house in Dulwich and the fruit of his father's ingenuity--a patent suspender clip. Lord Robert adored parties of all kinds and was, as Alleyn pointed out, asked everywhere. He knew intimately that section of people to whom the London season is a sort of colossal hurdle to be taken in an exhilharating leap or floundered over as well as may be. He was in tremendous demand as a chaperone's partner, could be depended on to help with those unfortunate children of seventeen who, in spite of all the efforts of finishing schools, dressmakers, hairdressers, face-specialists, and their unflagging mothers, were apt to be seen standing alone nervously smiling on the outskirts of groups. With these unhappy débutantes Lord Robert took infinite trouble. He would tell them harmless little stories and when they laughed would respond as if they themselves had said something amusing. His sharp little eyes would search about for younger men than himself and he would draw them into a group round himself and the girl. Because of his reputation as a gentle wit, the wariest and most conceited young men were always glad to be seen talking to Lord Robert, and soon the débutante would find herself the only girl in a group of men who seemed to be enjoying themselves. Her nervous smile would vanish and a delicious feling of confidence would inspire her. And when Lord Robert saw her eyes grow bright and her hands relax, he would slip away and join the cluster of chaperones where he told stories a litle less harmless and equally diverting. Mr. Bellairs's expression of geniality had become habitual. He might have been a cleverly made ventriloquist's doll with a pale rubber face that was constantly and arbitrarily creased in a roguish grimace. His expressionless eyes with their large pale irises and enormous pupils might have been painted. Wherever he went, whenever he spoke, his lips parted and disclosed his teeth. Two dimples grooved his full cheeks, the flesh creased at the corners of his eyes. Thus, hour after hour, he smiled at the couples who danced slowly past his stand; smiled and bowed and beat the air and undulated and smiled. He sweated profusely from these exertions and at times would mop his face with a snowy handkerchief. And behind him every night his Boys, dressed in soft shirts and sculptured dinner-jackets, with steel pointed buttons and silver revers, flexed their muscles and inflated their lungs in obedience to the pulse of his celebrated miniature baton of chromium-tipped ebony, presented to him by a lady of title. Great use was made of chromium at the Metronome by Breezy's Boys. Their instruments glittered with it, they wore wrist-watches on chromium bracelets, the band title appeared in chromium letters on the piano, which was painted in aluminium to resemble chromium. Above the boys, a giant metonome, outlined in colored lights, swung its chromium-tipped pendulum in the same measure. "Hi-dee-ho-de-oh," Mr. Bellairs would moan. "Gloomp-gloomp, giddy-iddy, hody-or-do." For this and for the way he smiled and conducted his band he was paid three hundred pounds a week by the management of the Metronome, and out of that he paid his Boys. He was engaged with an augmented band for charity balls, and sometimes for private dances. "It was a grand party," people would say, "they had Breezy Bellairs and everything." In his world he was a big noise. Marsh was one of the Queens of detective fiction, along with Christie, Sayers, and Allingham; while the other three were decidedly better than Christie, who was a gifted hack, within that trio, Marsh's work is probably, if only by a modest margin, the weakest. Sayers was probably the most accomplished writer per se, while Allingham, in her mature phase, created some of the most interesting and colorful characters; but Marsh's work is nonetheless of a more than satisfactory level of literacy, and the word that pops to mind for it is "engaging"--in her best work we may not always find the characters 100% convincing as flesh and blood, but we find ourselves rather wishing they were, in the sense that it would be a more interesting world with them in it (and that applies to both the white and the black hats). Her most pleasing works (something that is, of course, a subjective opinion) are pleasing, it seems to me, chiefly owing to some one or two characters whose personalities particularly engage us: Lord Robert Gospell in Death in a White Tie, Mrs. Bünz in Death of a Fool, Lord Pastern in A Wreath For Rivera, the entire Lamprey family in A Surfeit of Lampreys, and so on and so forth. When such a vivid focus character is absent, the tales are usually a little weaker, though it should be noted that those several in which a theatrical (literally) background is present often charm in themselves, owing to Marsh's love affair with theater (she had a lifelong involvement, mainly as a producer of no mean ability). Not a one of Marsh's works is less than pleasingly readable, so anyone fortunate enough to be utterly unacquainted with her oeuvre ("fortunate" in that you have it all yet to come, the banquet laid) is best advised when undertaking it to follow the Red King's advice to Alice: "Begin at the beginning and go on till you come to the end; then stop." There is no dedicated web site that I can find for the Alleyn books, and really but a single short individual page: Chief Inspector Roderick Alleyn - A Brief Biography, at the Classic Crime Fiction site. There are 32 Alleyn novels, plus a very few short stories. In these lists, the links are all to used-book searches for the title (via Abebooks). Some few can still be found in print new, but not many. As usual, the search results are sorted from lowest price up (that price, as always in used-book searches from this site, is the true total shipped cost--actual book price plus one-book shipping). Most titles represent a number of varying editions, from original hardcovers to late paperback reprints. Marsh worked mainly in the novel form, but wrote enough short stories, including a few Alleyns, to make up a book. There are a good few; this list may be incomplete--information seems hard to find. Note that this link may also bring up copies of the volume below--make sure which is which.